Dinan's Free Flow exhaust for the 3 Series improves exhaust flow by reducing back pressure, resulting in increased power output and a great sporty sound that's not so loud as to draw the wrong sort of attention. Dinan's Free Flow exhaust for the 3 Series improves exhaust flow by reducing back pressure, resulting in increased power output and a great sporty sound that's not so loud as to draw the wrong sort of attention. 100% stainless steel construction and exacting specifications ensure that the system fits correctly using the factory hangers and will resist corrosion for years to come. 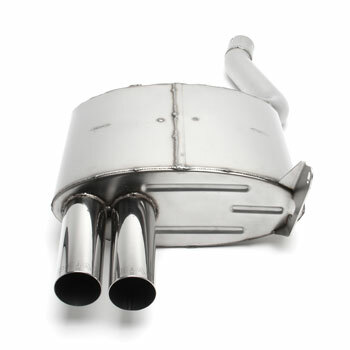 In addition to the rear muffler featuring two large polished stainless steel tips, the system also includes an enhanced ''Y'' center section, ensuring maximum flow.